A word I hate to hear in the beauty world is limited edition. You finally get your hands on the product, fall in love then as soon as you start to run out you frantically search to be faced with that dreaded out of stock sign. We've all been there! Today I thought I'd share some of the discontinued products that I loved, with a hope that one day they'll soon return! For so long, my signature fragrance was the Ralph Lauren Ralph Cool perfume. To me, it was the perfect Summer fragrance but soon after they expanded the cool range, my fragrance of choice was long gone. This ultimately resulted in me stocking up on multiple bottles to keep my obsession going but when it got to the point where the fragrance had been out of stock 10 years.. it was time to move on. To fill the fragrance void I turned to Coach Poppy, a gorgeous Spring floral fragrance but soon after two bottles.. I was saddened to find it was being discontinued. 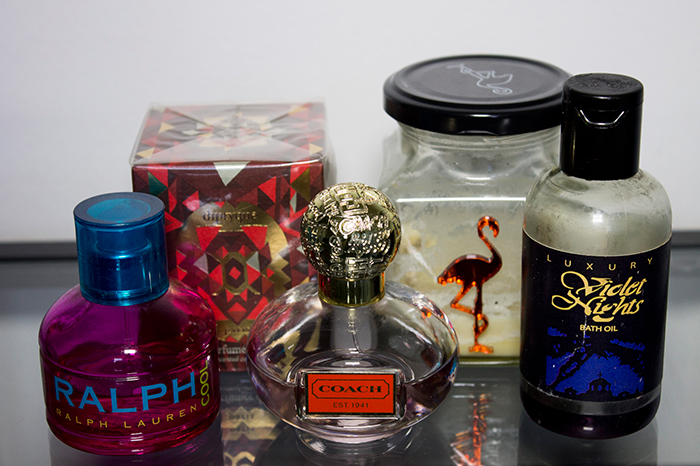 I don't have much luck with fragrances do I! I'll be enjoying this one until the very last drop. It currently is still available via Debenhams but once it's gone, it's gone! I'm always on the hunt for interesting candles and I couldn't resist the Flamingo Candles Chocolate Orange fragrance. I believe this one came out during the Christmas season but sadly was limited edition and I wasn't able to stock up before they disappeared. It's exactly how you'd imagine it to smell, like a room filled with Terry's Chocolate Orange.. absolute heaven! While we're on the subject of candles, Diptyque always bring out the best during Christmas and I absolutely fell in love with the Diptyque Amber Oud Candle. I managed to pick this up during the Space NK sale but silly me ordered the smaller size so I was only able to enjoy this for a short time. I still have one last candle of this scent but I just can't bring myself to use it yet! At the launch of Lush's Cosmetics to Go Book, we were given a lovely sample of the Lush Violet Nights Bath Oil which was made especially for the event. It was a product which was made by the company which preceded Lush and I was so sad to hear you couldn't actually purchase it. A few drops turns your bath into the most gorgeous, silky water with the lovely violet scent which puts you right to sleep. It did make a little appearance on the Lush Kitchen page so I have my fingers crossed that one day they'll bring it back! There you have it, my discontinued favourites! I'd love to know what products you wish hadn't been discontinued and if you've stocked up on your favourites like me.